Happy Birthday Geoff Hunt (and me:)! Geoff Hunt was born on March 11, 1947; I was born on March 11, 1957. 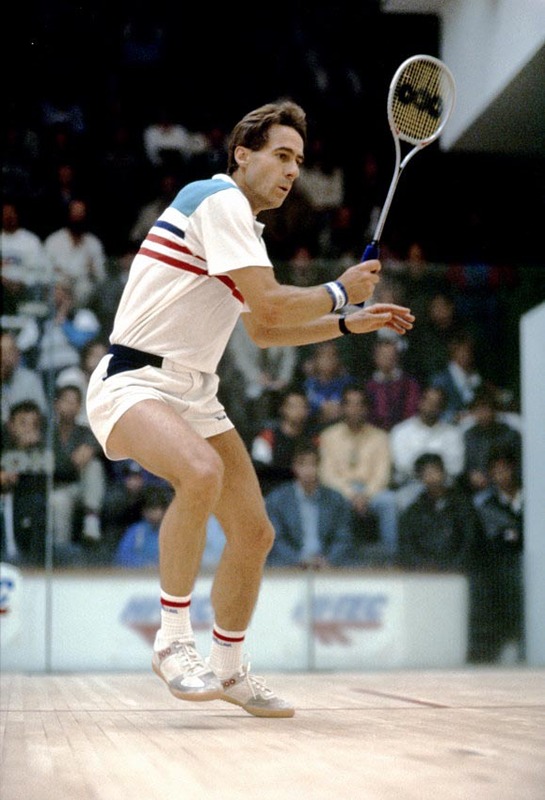 Geoff Hunt started playing squash at the age of 12, was at his peak in 1977 – the year I started playing squash (at the age of 19). In 1977 Canada had three official types of squash: balls, national championships, rules. We used to play them all – sometimes all three on the same day! Geoff Hunt ran his legendary 26(?) x 400’s @ 75s; I ran 24 x 400’s @ 80-85s for interval training. 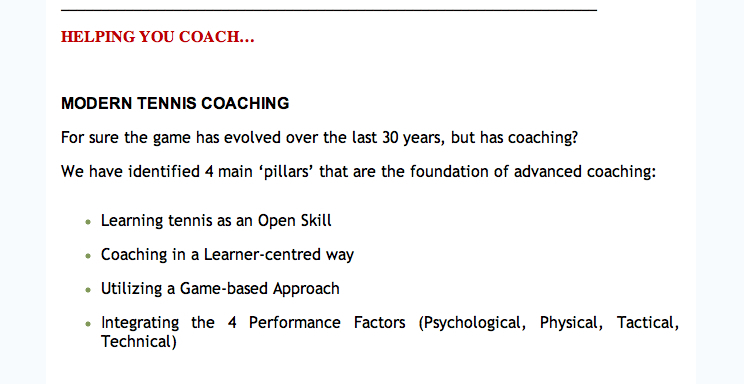 Geoff Hunt was Head Coach at the Australian Institute for Sport, leaving High Performance sport to go and coach currently at a much lower level in Qatar; I was Canadian National Jr. Men’s Coach and psychology consultant to the Canadian National Squash Team Programs from 1987 to 2000 (as well as National Tennis and Racquetball Programs) leaving to coach currently at a much lower level at Smith College. Geoff Hunt has had two hip replacements; I have had one hip replacement (need the other one too!). Note: I personally know more than 30 squash coaches who have had hip replacements, so we were not alone in our belief that high volume training was the way to go! I actually had my very first squash private lesson in 1978 with another Australian, Heather McKay, at the Toronto Squash Club, one of the few facilities in Toronto that actually had wide international courts. I prepped for the lesson by reading her book, only to be chided “Why are you trying to volley everything? Two years later I was playing her in an exhibition match – at that point we both worked for the Racquet Sports Group of Canada – I was manager/pro at the Sherbourne Club (11 American/2 International courts), and she was the pro at the Dunfield Club. But “our” (meaning the “B” and later “A” league players I played squash with) Bible at the time was Geoff’s Book “Geoff Hunt on Squash“. Typed summaries of his two Chapters “Match Play” and “Tempo and Temperament” could be found on the bulletin boards of nearly every club. I wholeheartedly embraced the Australian “attritional” , fitness-based approach to squash – although now I realize a much wiser and healthier approach would have been to cultivate the current attacking Egyptian style. These chapters, as well as being “tactical” were also “mental”. Phrases such as “play hard from the start” and “never throw a game” reverberated through my head during tough matches. Later as a very busy mental training consultant, I realized this list of key points or cues was actually a basic “focus Plan” for squash players. 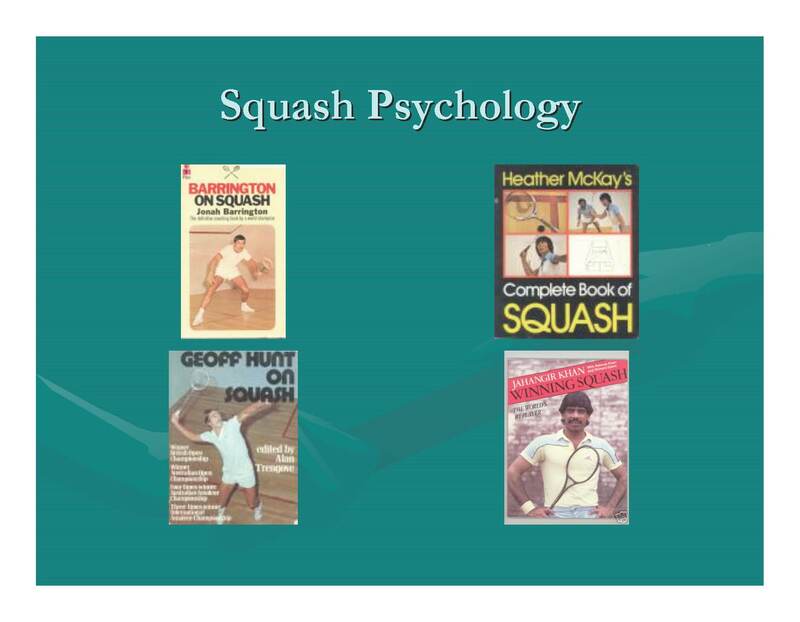 At the time there were only a couple of actual sport psychology books, with the number only increasing dramatically in the late 1980’s. I actually started coaching squash the summer after I played it for the first time. My first job that featured coaching squash was Head Instructor at the 1978 JCC Summer Racquets Camp – we taught tennis, squash, badminton, racquetball and ping pong. My current competitive interest still involves all of the racquet sports: Racketlon! I am pretty sure I could take Geoff in a ping pong match – but just to be sure I may wait another 10 years to challenge my hero on his birthday! 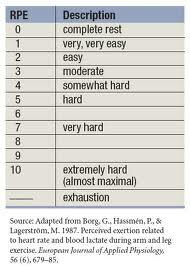 Unless you have a sport science degree the complexities of squash training can be somewhat difficult to comprehend. 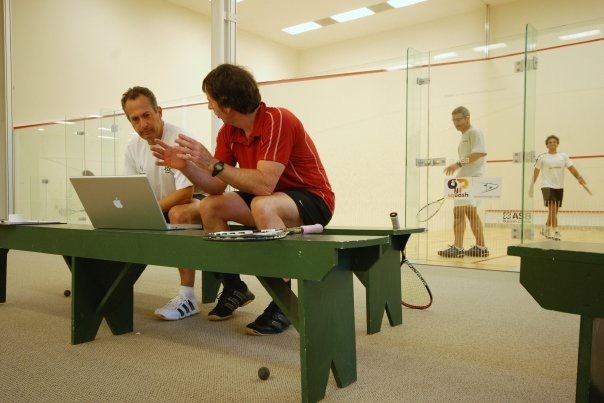 Squash is a difficult sport to coach as squash athletes need to use all three energy systems, and almost all of the physical qualities also play an important role in squash performance. Many sports only need to emphasize one or two qualities: for example strength and power are primordial for an American Football lineman – whereas aerobic qualities have minimal importance – on the other hand aerobic performance is everything to a 10,000 meter specialist, with power and speed (as commonly defined – not referring to “speed-endurance”) of little significance. 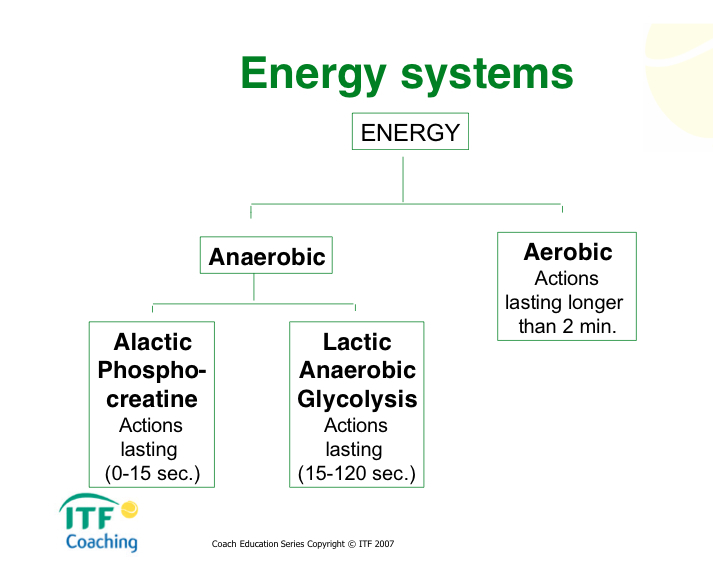 The “Energy Systems Chart (ITF, 2007)” is a commonly used, over simplistic representation of sport physiology, as in most team, dual and combat sports, all three energy systems come into play, often simultaneously, during a competition. 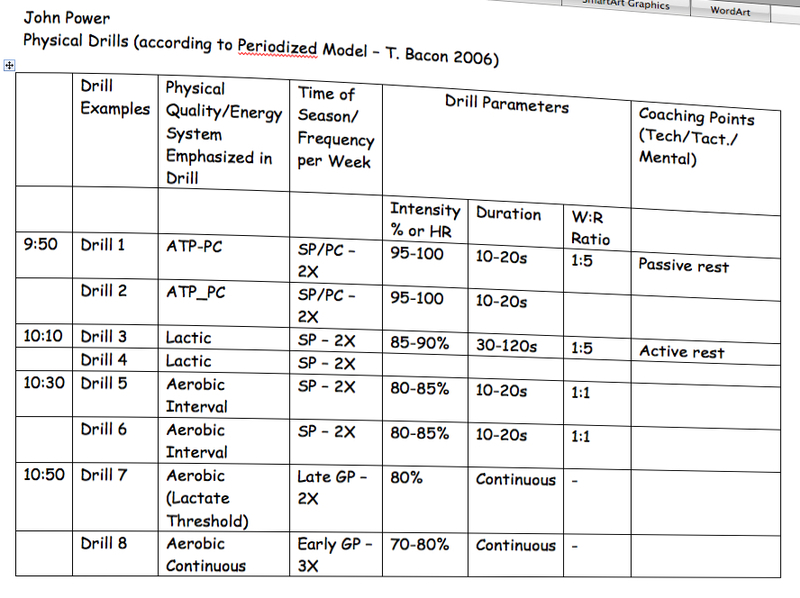 Keeping in mind this is only one of several ways to organize or think about aerobic training, note that the aerobic training levels (I to IV) can be defined by the intensity of effort (percentage of maximum heart rate or percentage of VO2max – the HR method being the most practical one to use for squash coaches), and that at each level there are different physiological adaptations going on behind the scenes. Level 5 = Borg 10 = HR 190-200, this is that last ditch effort, in the last couple of rallies – you are toast (due to high lactic acid accumulation:). What to do with this information? When I helped organize the College Squash Association’s Coaching Conference a few years ago (2006??) I asked John Power (Jonathon Power’s dad – a Squash Canada Level 4 Squash Coach, coaching at Dartmouth College at the time) to do an on-court presentation of squash drills and conditioned games to train each of the aerobic levels in order to show college squash coaches a) that aerobic training can be done effectively on court mixed in with “traditional” drills and games; and b) how the same drill or game can be used to train multiple aerobic levels by simply changing a few parameters. Here is a summary of the organization John used for his presentation. Note that there is an ideal progression for developing aerobic qualities, basically less intense to more intense as you move through the season, so we have added in the phase of an annual periodized plan to indicate when the training should be emphasized. Can you demonstrate your understanding by thinking of an appropriate drill or game for each of the physical qualities listed in column 3 of the chart? GP = general preparation phase; SP = specific prep. ; PC = precompetition. Aerobic training can be done on court to save time, using standard squash drills and games. 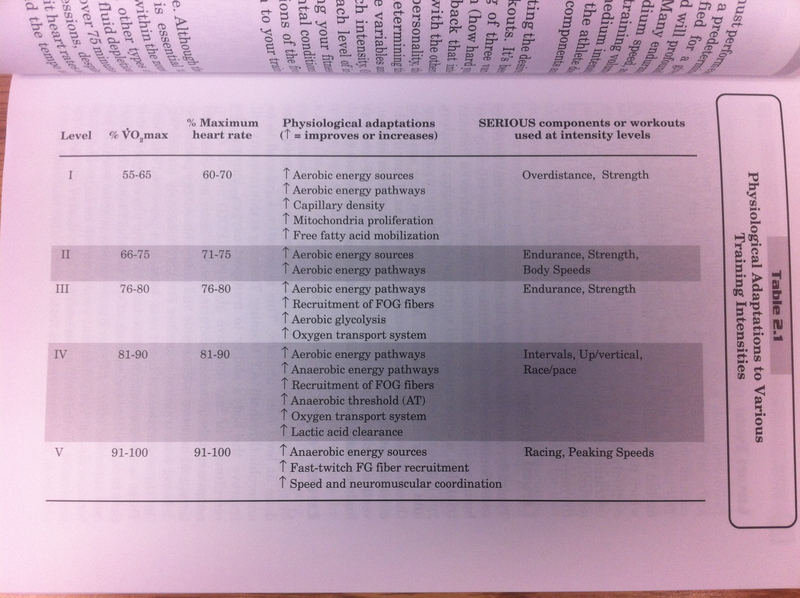 To get specific physiological adaptations important for the aerobic system, certain drill parameters (e.g., HR) must be followed. “Complicated” physiological measures of intensity (i.e., HR, % of VO2 max) can be replaced with easier, more subjective measures.